Submit A Message Or Tip! This is bad news for the general public and those who have rightly earned their medals through honorable service in the military. It is however excellent news for people like “Sir Patrick” aka Roger Sisson who go around with a chest full of fake medals and use them as a props to scam people. What a shame that this is not illegal. This entry was posted in blog and tagged 'Sir' Patrick Donovan Flanagan O'Shannahan, blog, California, Florida, Khristian Knight, Kristian Knight, Matthew Abraham, Roger Eldon Floyd Sisson. Bookmark the permalink. As ex-military myself…I have some sympathy with those unhappy about the ruling. However, I don’t think these mentally ill people stole anyone’s valor. Instead…they made up some valor for themselves. Big difference. In all walks of life…we meet the occasional spectacular nut..like in the photo…but don’t we all know immediately…that they are nuts? Hi Terry! Sadly many people do get deceived by it, especially those that don’t have any experience with military matters. I’ve talked to tons of people in the SP situation specifically who did and I’m guessing the rate of people deceived would probably be higher in situations where the con-artist didn’t tell such …outlandish… stories. He was/is able to translate that good will into various ways of doing harm to people. There is some confusion about the Supreme Court’s ruling on the Stolen Valor Act about what it does and does not mean. The question addressed by the Court was limited to speaking about fake military service and fake awards. 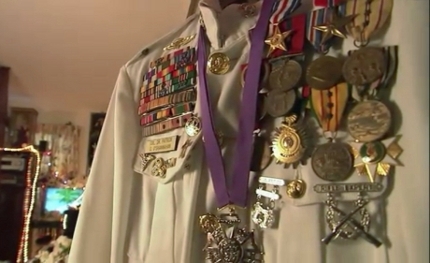 Wearing unauthorized uniforms, medals, ribbons and other devices is still illegal and was not included in the ruling. It is still also very illegal to forge and/or alter military and documents and to benefit from fraudulent schemes that deceive based on fake military service. Criminal courts also distinguish between those who arm competent and those like “Sir Patrick” who are clearly mentally ill.
Got a message or tip about this? Also a big thank you to those who have sent in photos over the years as this helps others to identify and stay away from this dangerous felon.